If you abjure a belief or a way of behaving, you state publicly that you will give it up or reject it. The abnegation of something is the giving up of your rights or claim to it, although it might not be in your best interest to do so. When you abscond, you leave suddenly from a place that has imprisoned or persecuted you, or you leave from a place with something that doesn’t belong to you. You accost a stranger when you move towards him and speak in an unpleasant or threatening way. When you adjure someone to do something, you persuade, eagerly appeal, or solemnly order him to do it. You affront someone by openly and intentionally offending or insulting him. When something bedevils you, it causes you a lot of problems and difficulties over a period of time. When you beleaguer someone, you act with the intent to annoy or harass that person repeatedly until he gives you what you want in the end. If you are beset by something, you are experiencing serious problems or dangers because of it. If you circumvent something, such as a rule or restriction, you try to get around it in a clever and perhaps dishonest way. You coerce people when you force them to do something that they don’t want to do. Duress is the application or threat of force to compel someone to act in a particular way. If a fact or idea eludes you, you cannot remember or understand it. If you emulate someone you try to behave the same way she does because you admire her a great deal. If something encumbers you, it makes it difficult for you to move freely or do what you want. When someone entices you into doing something, she is trying to lure, tempt, or attract you into doing it in a persuasive manner. If you expostulate with someone, you express strong disagreement with or disapproval of what that person is doing. A feint is the act of pretending to make a movement in one direction while actually moving in the other, especially to trick an opponent; a feint can also be a deceptive act meant to turn attention away from one’s true purpose. When you incite someone to do something, you encourage, urge, or highly persuade her to do it. An interlocutor is the person with whom you are having a (usually formal) conversation or discussion. To parry is to deflect something or ward something off. If you refrain from doing something, you do not do it although you want to. To remonstrate with another is to tell that person that you strongly disapprove of something he has said or done. If you sidle you walk slowly and cautiously in a particular direction, often sideways, and usually because you do not want to be noticed. Something that stymies you presents an obstacle which prevents you from doing what you planned to do. A teetotaler is one who does not drink alcohol. My brother and his wife choose to avoid the craziness of the winter holidays, eschewing fancy Christmas celebrations. They eschew or steer clear of decorating a tree with lights or putting up garlands. They deliberately eschew or avoid at all costs what they see as a widespread commercialization of a holy season. My nieces and nephews, however, do not want to give up or eschew their tower of Christmas gifts just because their parents don’t believe in the season. Quiz: Try again! 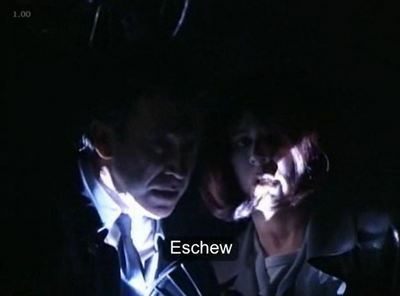 What does it mean to eschew something? To criticize it at every turn because you don’t believe in it. To avoid doing it for the sake of personal principles. To decorate it not too heavily to make it look not too fancy. If you eschew something you deliberately avoid doing it, especially for moral reasons. Eschew Chewing Once I chewed tobacco, but now I eschew chewing because I found out it can cause mouth cancer. Home Improvement Aliens apparently eschew well-lit housing.